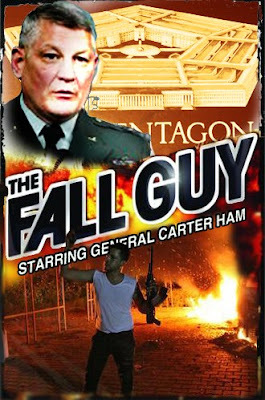 Rear Admiral Charles M. Gaouette has been tapped to play a costarring role in Executive Treason Films latest production, Fall Guy. Alongside General Carter Ham, Gaouette can be seen playing an Admiral speaking out in support of sending help to a besieged Embassy in Bengahzi, Libya. The two men, ready to send help, are commanded by the upper echelons of the US government to "stand down" which results in the death of a US Ambassador and three other American citizens. Unfortunately, the fiasco brings the heat at home, and the President can't be held accountable for anything. Somebody must lose their job!! Political logic dictates that those who were most eager to help must pay the price. Watch General Carter Ham and Rear Admiral Charles M. Gaouette fall on their swords at the whim of a President willing to kill American citizens for political reasons. Who will be next as The Fall Guy becomes Fall Guys? Only time and Executive Treason Films can tell. I'm surprised George Bush hasn't been thrown under the bus on this one.